Jester must be one of the most easily recognised yachts in the world with her full enclosure and characteristic junk rig set on an unstayed mast. 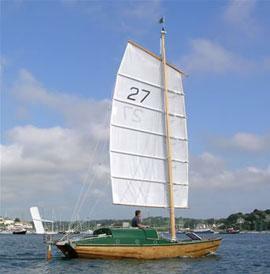 The hull is a 25ft Folkboat, although carvel- rather than clinker-built and cold-moulded rather than planked. Jester, a modified Folkboat, has an illustrious history: she was designed by Blondie Hasler in 1953 as a small boat that could be controlled from within the cabin, operating from a central control hatch. Jester competed in the first OSTAR Transatlantic race in 1960, which was won by Sir Francis Chichester in Gypsy Moth II . Jester came second. She competed in every single subsequent OSTAR, but in 1989 was seriously damaged under sail and lost. A replica was built by Aldeburgh Boatyard in 1992, and she remains an instantly identifiable craft, with her junk rig and control hatch.